After reading a friends post about a one bedroom, 2 bath co-op in New York City being worth $600,000 and $740,000 a day or so ago I really, really had to look at NYC. 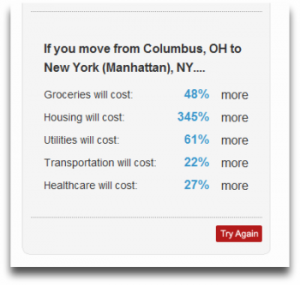 I looked at Queens or Brooklyn first and the sticker shock was not that bad, it was not as expensive as LA (for some reason LA was the first place I compared Columbus to…) then I looked at Manhattan. Compare to cities nearby and far away. Columbus is darn reasonable for the size of the city. Relocating to Columbus? From Columbus?